Pressure gauges are commonplace and used to indicate the pressure of a pipeline, but do you know how they work and why there seems to be large differences in pricing for what appears to the same product? The importance of a pressure gauge is often overlooked. A well-designed and properly sized pressure gauge should provide accurate service for years. The performance of spray nozzles, pumps and other fluid components are evaluated by pressure gauges in the fluid system. A quality pressure gauge will pay for itself by increasing the accuracy and control of your process. Since the Bourdon tube style is the most commonly used design, this article will focus on Eugene Bourdon's invention over 175 years ago. The basic operating principle of a Bourdon tube gauge is a hollow, C-shaped tube which is opened to pressure at one end and welded shut at the other. When the tube is pressurized it tries to straighten-out, moving attached linkage and a pointer to indicate the precise pressure. The design of the Bourdon tube, having a curvature and thus the inside radius being less than the outside radius makes it possible to correlate the movement of the tube to a specific pressure. Peel-off the case to see what is inside! Actually, starting with the case is a good beginning. The outer case of a gauge is typically made from plastic, painted or plated steel, brass or - most commonly - stainless steel. Some cases are designed to be opened for servicing the gauge, but most are not, so you never get to see what is inside. The complexity of the case is the first indication of cost; a case designed to allow a glycerin/silicon fill needs to seal to prevent leakage and thus is slightly more complex/expensive than a "dry" gauge that is not "fillable". Likewise, some gauge cases are made with a solid front so in the event of a catastrophic internal failure the process fluid is directed backwards and presumably away from personnel. Finally, cases can be designed for mounting within panels or simply mounted to the fluid system. The pressure gauge socket (inlet) is the first part of the gauge the process fluid contacts, unless you are isolating it with a diaphragm seal. 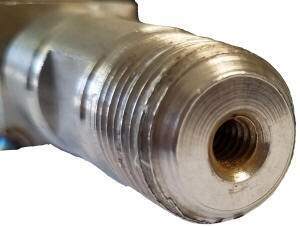 Inexpensive gauges simply have a hole drilled into the inlet connection, more expensive gauges have a threaded hole, in which can be installed a restrictor orifice. A removable restrictor orifice provides two basic functions, slight dampening of the inlet surge and protecting the internals of the gauge from particles that can become embedded within the Bourdon tube, causing it to malfunction. If some foreign material becomes caught on the orifice, it can easily be removed, however once material becomes lodged within the Bourdon tube the likelihood of removing it is slim. The body of the socket and especially how the Bourdon tube is welded to the socket is critical to a long-lasting pressure gauge; you want quality materials and quality welding. Welding style and quality equally applies at the closed end of the Bourdon tube, where the linkage is attached. 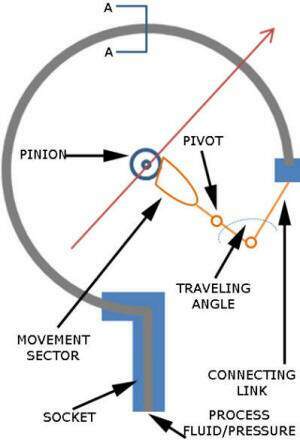 A pivot point to which a geared movement is attached is connected to the linkage on the other side, thus as the Bourdon tube "flexes", the angle of the linkage moves the geared movement. These internals are protected from moisture or an aggressive environment when the gauge is filled with glycerin or silicon. The gauge quality and its cost are a reflection of these internal components. For example, machined components are often of higher quality and have more "endurance" than less expensive stamped components because they need to be thicker to machine. The geared movement rotates the pointer to the corresponding scale on the gauge dial (face), thus finer gears equate to increased accuracy. The materials used are also an indication of quality; stainless steel components will often outlast copper alloy parts. The pointers themselves vary in complexity. Some like the one picture here enable fine adjustments to compensate for altitude or wear caused by pulsations and vibration. Pointers can also trigger separate high and low pressure pointers affixed to the gauge window to record extreme conditions when incorporating a pressure transducer is not possible. The pressure gauge dial has a scale that is calibrated to the Bourdon tube, if you want, the dial can be customized with a company name, logo or colors - such gauges incur an artwork charge and have 10+ weeks lead-time associated with them. 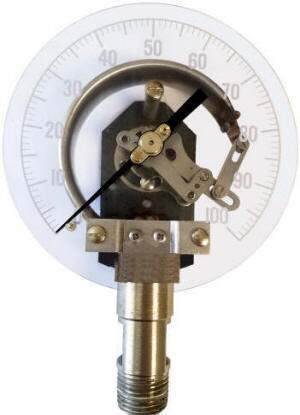 You will often see the accuracy of a pressure gauge expressed as “3-2-3% ASME B40.1 Grade B” or “2-1-2% ASME B40.1 Grade A” and this refers to the accuracy for each third of the dial scale. Therefore, the 1st and 3rd sections of the dial are the least accurate and the middle portion of the gauge is most accurate. When selecting a pressure gauge try to choose a scale such that your normal operating pressure will fall within the middle portion of the range to maximize accuracy. Some gauges offer accuracies of 1% of full scale (FS) which means it is 1% accurate anywhere on the dial. The last piece of a gauge is its window, which protects the pointer and gauge internals from the surrounding environment. A gauge window can be made of glass, tempered glass and hard or soft plastic. Soft plastic windows are often referred to as thermal compensating because they flex, allowing for glycerin/silicon fill to expand without bleeding from the gauge case. This is also why filled gauges usually have an air bubble towards the top, allowing for expansion due to heat or altitude. With an understanding of how a Bourdon tube gauge works, the components involved and accuracy you are empowered to select the most appropriate pressure gauge for your product or application.